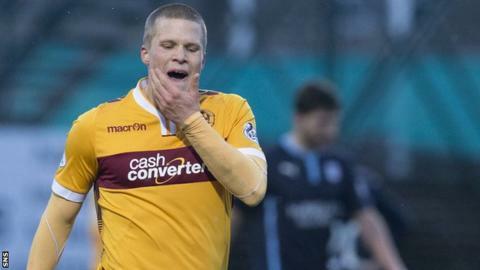 Estonia forward Henrik Ojamaa has left Motherwell after rejecting an offer to extend his second spell at Fir Park. The 23-year-old was on loan from Legia Warsaw but has decided to take up an offer of another loan deal, with Scandinavia a likely destination. Well general manager Alan Burrows told BBC Scotland: "He had other offers and we totally respect his decision. "Ian Baraclough is working through targets and we hope to bring in a couple of replacements." Burrows, who said he could not reveal Ojamaa's next destination as the deal had not been completed, said the Scottish Premiership club had explored the possibility of signing the player permanently before offering him terms on a loan extension. "The club made Henrik the best offer it could, but he has opted to try something different," he said. Burrows thanked the player and his agent for making a decision early enough for the Well manager to start his search for a replacement. Ojamaa, who has made 23 appearances for Well this season, scoring four goals, had made his departure from Fir Park public on social media. "My loan at Motherwell is now officially up," he said on Twitter. "I leave with a heavy heart. "Hopefully me leaving will give a chance to many good youngsters at MFC to grab a position in the starting 11. "Although the league position is not as good as Motherwell deserves, I still thoroughly enjoyed my time at the club that is very close to my heart. "I am sure the coaching staff and my team-mates/friends will finish the season strong and I will remain a passionate supporter of the club." Ojamaa, who began his senior career at Derby County, left Motherwell for Legia Warsaw in 2013 after a season in Scottish football during which he scored four goals in 47 appearances. He also played for Stafford Rangers, Alemannia Aachen, Fortuna Sittard and Rovaniemen Palloseura before heading for Lanarkshire. Ojamaa leaves Motherwell sitting 10th in the Premiership, two points above St Mirren in the relegation play-off spot.